2 Beds 1 Bath 78,000 Sq. ft. 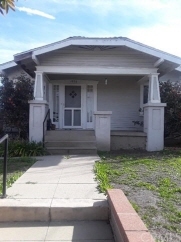 Description: This california craftman’s bungalow is located in the heart of san pedro’s charming holy trinity area. Large backyard with peek-a-boo view of the harbor and vincent thomas bridge. Home has character including built-ins. Bring your toolbox and turn this home back into the gem it is meant to be for the right price.